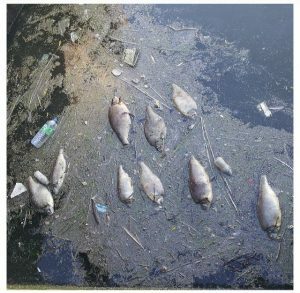 Thousands of fish died in the River Lea last week after rain washed the accumulated pollution from East London’s roads into the river. The River Lea is one of the most polluted rivers in Britain, damaged in different ways all year round. Road run-off is washed into the river every time it rains. Thousands of homes send their wastewater down the wrong pipe and into the river. Sewage effluent from Deephams Sewage Treatment Works adds e-coli and phosphate. There is too little plant life, so little refuge for fish. The poor general health of the Lea means the wildlife that depend on it are vulnerable when it gets hot. The hot weather will have lowered Dissolved Oxygen (DO) levels, and the lack of rain for two weeks meant large amounts of pollutants had built up on the roads. On Monday, the Lea was teetering on the brink. The pollution swept into the Lea by the rain on Monday pushed it over the edge. The road run-off contained oil, copper, lead, and zinc from vehicles plus grit and dirt. This tide of pollution caused DO levels in the Lea Navigation to drop to zero and in the channel of the Lea to the east of Hackney Marsh to less than 10%. Fish can’t survive in conditions like this. It turned the river dark grey, eels crawled out of the water to escape, while thousands of other fish died. The shocking truth is that this is meant to happen, the system worked as it is designed. Storm water run-off flows straight into the Lea and its tributaries from roads across East London. Thames21’s Love the Lea campaign has identified solutions we can make a start on now. 1) Many fish were saved by machines that pumped oxygen into the Lea. Are they in the right places? Do we need more of them? Were they used early enough? Could more fish have been saved? The Environment Agency needs to examine these questions and make recommendations. While the oxygenators are a sticking plaster, their use needs to be as effective as possible. 2) The River Lea doesn’t have enough resilience – there is too little aquatic vegetation. The hard concrete and metal sides means there isn’t enough habitat for fish. These plants also produce oxygen, creating refuges. Our Project Reedbed report indicates there’s scope for 10 times the amount of existing reedbeds. Work needs to start now creating more reedbeds. Thames21 has a small amount of funding to install reedbeds and is working to attract more. Current reedbed creation must be stepped up. Councils could make use of Section 106 funding from riverside developments. 3) Where possible, natural drainage systems could be built to remove pollutants from the water that washes off roads and car parks before it reaches a river. We’re working to create a Sustainable Drainage System to intercept run-off from the A10 in Enfield, Transport for London needs to identify many more of its roads where this can happen. Car Parks that drain to rivers need to turn unused corners into raingardens as Portland, Oregon has done. 4) Currently the levels of pollution from Deephams Sewage Treatment Works in Edmonton are too high. A new permit comes into force in 2017 which sets tougher effluent standards and the works will be upgraded to meet these by 2018. To extend the life of this £300 million upgrade a comprehensive network of mini-wetlands and other natural drainage systems (or SuDS) must be created to slow the amount of water that flows to the Sewage Works, leaving more space to treat waste water. These will also help reduce street sewer flooding. The River Lea is treated as a dumping ground. There has been massive spending on developing the areas around the river which puts the river environment under added pressure. We now need to see more done so the health of the Lea improves, taking it back from the brink. This week has shown that so many people care about the Lea, and this makes a difference. We need to keep this momentum going. If you haven’t already, sign our Love the Lea Pledge and help spread the word. We will collate your pledges and send them to the Mayor of London to call for action.